'Tryon Hall', the Cornelius Kingsley Garrison Billings estate designed by Guy Lowell c. 1903 at the lower end of Fort Tryon Park along the Hudson River in New York City. 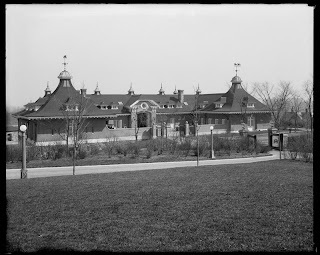 The lodge was expanded by Lowell into a full time residence in 1907. 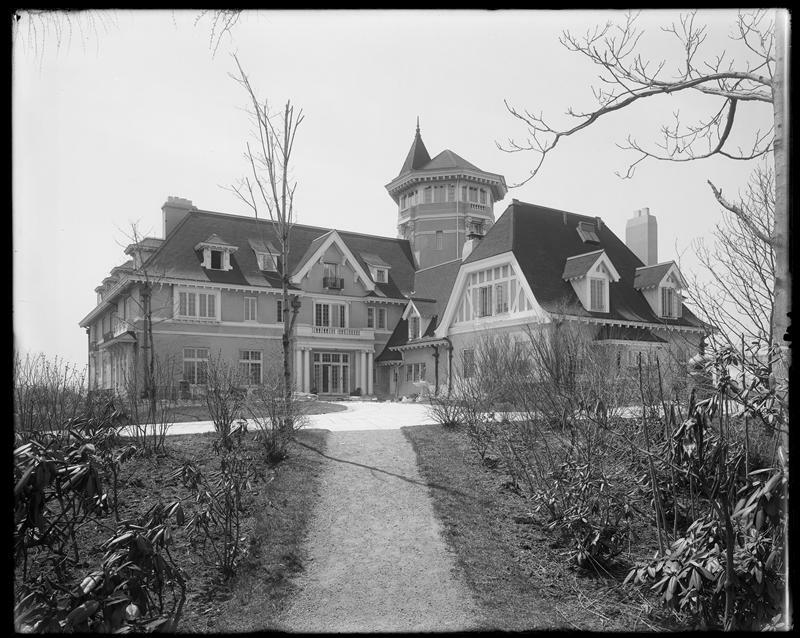 Billings sold the estate in 1916 to John D. Rockefeller Jr. and moved to his new country estate 'Farnsworth', also designed by Guy Lowell, in Oyster Bay, Long Island (as well as keeping an apartment at 820 Fifth Avenue). Rockefeller wanted to demolish the house and donate the land to the city for use as a park but was ultimately rejected. 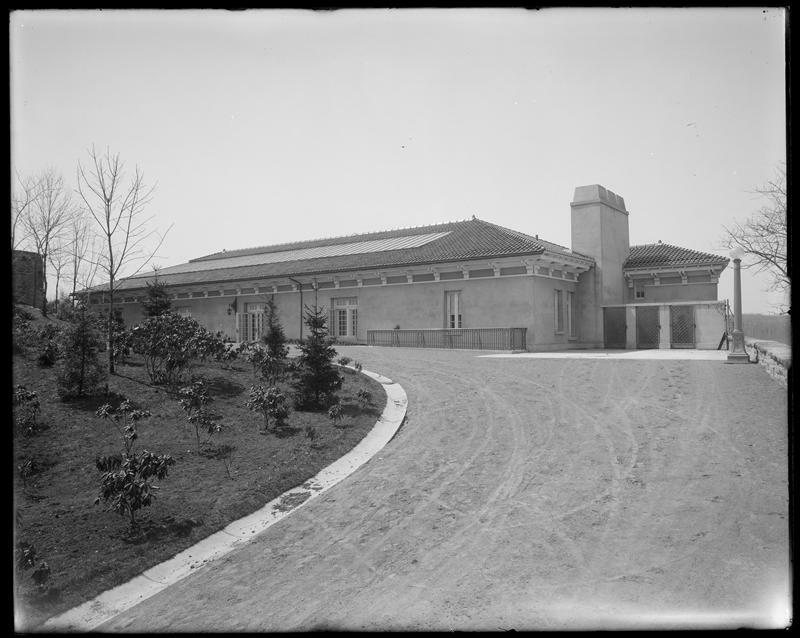 The house would eventually burn to the ground in 1926 and Fort Tryon Park was completed in 1935 after the city finally accepted Rockefeller's donation. Click HERE for a Christopher Gray article on 'Tryon Hall'. 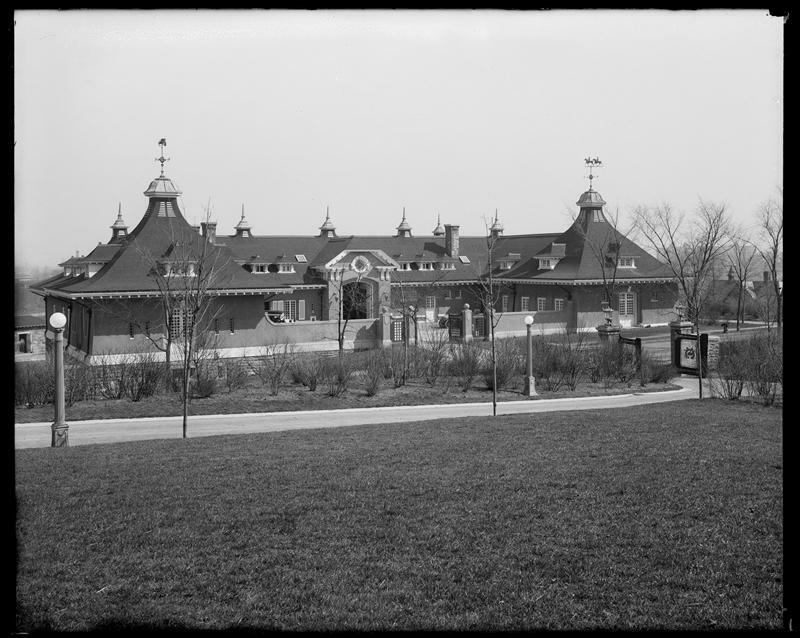 Click HERE to see the former entrance to the estate on bing. I wish Ancient were here---he'd find the link to an article about the driveway---I haven't got time right now. 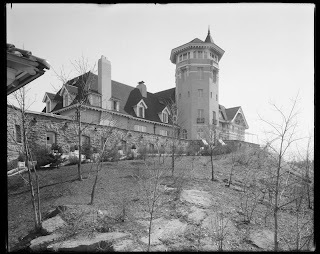 Beginning in 1907, Billings, his wife Blanche E. MacLeish Billings, two children and 23 servants moved to a full-time residence to the west of the stables, on a promontory 250 feet (76 m) above the Hudson River. 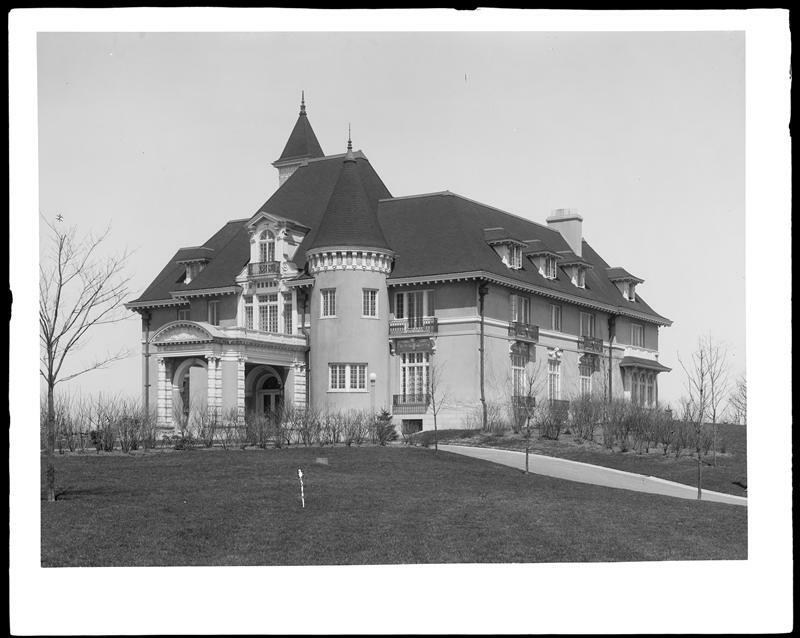 Described at the time as "In the style of Louis XIV", the house had several large towers, a Mansard roof along with a 75-foot (23 m) marble swimming pool, squash courts and bowling alleys. It was called Tryon Hall. 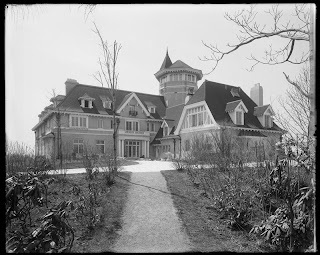 The cost was $2,000,000, and it was generally considered among the most lavish private houses in Manhattan. It had towers and turrets, conical steeples, oriel windows, and vast expanses of shingled roof. It stood on Manhattan's highest point, 250 feet (76 m) above sea level, with 20-mile (32 km) views of the Hudson Valley. His 25-acre (10 ha) estate encompassed formal gardens, a 126-foot-long (38 m) bathhouse with a 75-foot (23 m) indoor pool, and a yacht landing on the Hudson at Dyckman Street. There he had his 232-foot (71 m) yacht, Vanadis. 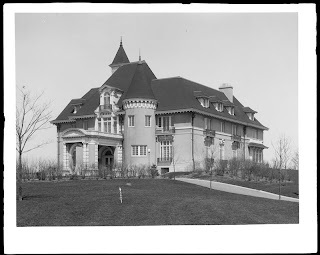 Billings then hired the architects Buchman & Fox to design an extravagant entry to his estate. They laid out the roadway and proposed a great arched stone gallery to carry the top section. Most of the stone was quarried right on the site and the surface of the roadway was paved with chamfered bricks. The total cost of Billings’ new driveway was $250,000. "The house would eventually burn to the ground in 1926 ...."
Hmm. A little arson a la Winfield Hall, or is this actually the ghost of Frank Woolworth at work? Great! Some new photos of the place I've not seen yet. I've been searching for floor plans of the building for years but can't seem to locate any, even in any of the Guy Lowell connected sites or books in various libraries. This is the picture I found of the drive. I am glad to find folks that enjoy this stuff as I do.